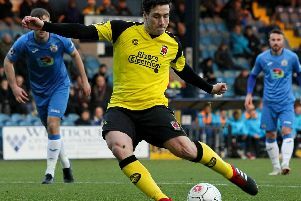 Chorley twice came from behind to earn a point against relegation-threatened Darlington despite playing the last 10 minutes plus seven of added time with 10 men. Substitute Marcus Carver lost his discipline in earning two yellow cards within as many minutes, angry manager Matt Jansen branding his second rash challenge ‘stupid’. Volunteers had cleared the Blackwell Meadows pitch of several tons of snow to get this game on but a greasy surface made it difficult for both sides. Delial Brewster fluffed an early chance for the Magpies after racing clear on goal only to miscue his shot into the side-net. It proved costly as the Quakers went in front in the 16th minute. Reece Styche was played through and hit a fierce shot into the roof of the net. Chorley drew level seven minutes later with a cracking goal from Adam Blakeman. Jason Walker held the ball up well before laying it back to the onrushing Blakeman, who buried a first-time cross-shot into the far corner of the net. Darlington edged proceedings up to the interval without making the breakthrough but they regained the lead three minutes after the break. Josef Wheatley jinked his way into the box and won a penalty from Andy Teague’s challenge, Stephen Thompson stepping up to confidently tuck away the spot-kick. Carver replaced Brewster soon afterwards and was instrumental in the Magpies’ second equaliser in the 75th minute. Creating room for a cross down the left, Carver centred low for Walker, showing great opportunism, to flick the ball just inside the near post. Carver’s contribution was cut short within five minutes, his reckless challenge in frustration after losing possession inevitably resulting in a second caution and red card. Although both teams pressed for a winner in a frantic finish, it was Chorley who came closest to grabbing three points, Josh O’Keefe seeing a great strike brilliantly saved by Quakers keeper Aynsley Pears. Jansen was both pleased and frustrated at the result. He said: “We won a hard-earned point in difficult conditions. CHORLEY : Urwin, Hughes, Blakeman, Teague, Leather, Jordan, Wilson, O’Keefe, Walker, Brewster (Carver,53), Cottrell. Subs (not used): Roscoe, Whitham, Anson, Beesley.